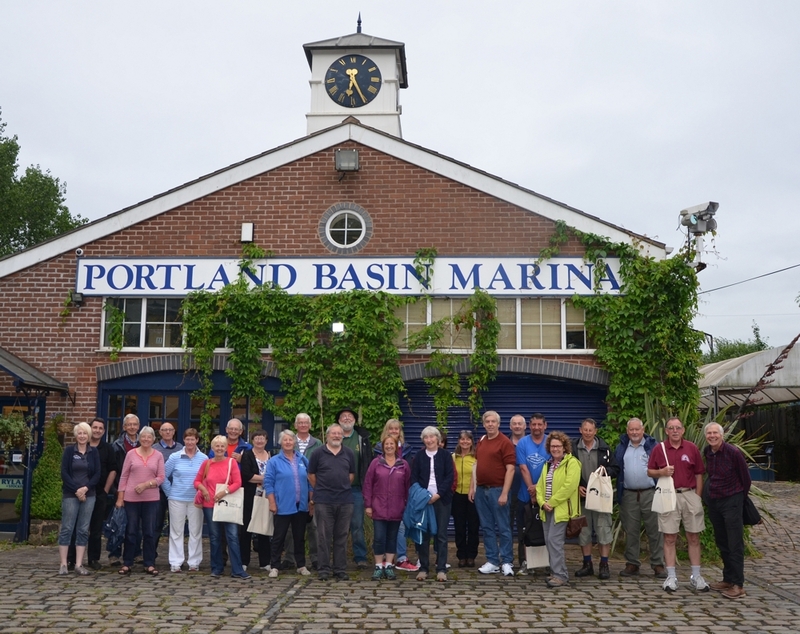 The happy group is pictured here by Julie Arnold of Waterway Images at Portland Basin Marina on Friday 23rd June 2017. 12 boats and their crews had reached this rendezvous via the Lower Peak Forest and Ashton Canals. Help on Marple and Ashton Locks was provided by members of the Tudor Cruising Club and Canal & River Trust Volunteers. Guy and Sandra Holding kindly hosted this first gathering. 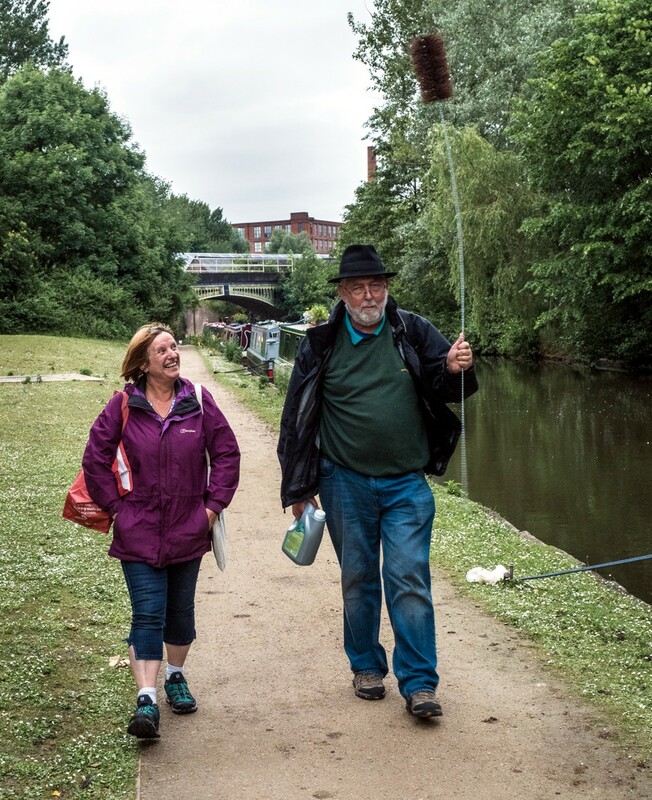 Some of them are carrying their welcome goody bags stuffed full of useful information about the trip as well as their complementary Huddersfield Canal Society membership packs complete with Summer edition of Pennine Link, the Society’s quarterly magazine. This image by the undersigned shows Ray Butler with what must be a useful purchase from Portland Basin Marina. Perhaps he will tell me the real use for it as we join him over the Pennines. 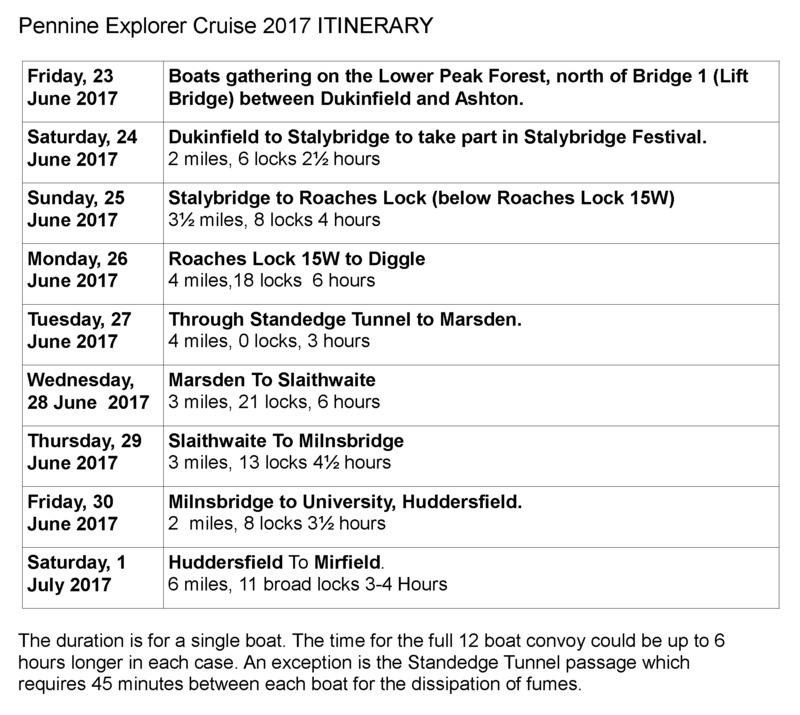 Here is the final Itinerary for the Cruise showing where the boats will be each day – we will be delighted if you can come along and enjoy the convoy, or even help out a bit! Here’s to adding some colour and more activity to the Narrow! Our Marsden Shuttle will be travelling from its home at Tunnel End, Marsden, westward, to be at this year’s Stalybridge Festival, providing free trips to the general public throughout the weekend. However, volunteers are still needed to help on the Saturday and Sunday of the Festival; can you help please? As boating is the quickest way to slow down, these journey durations are very much approximate; all part of the adventure! Please email the organiser, Mike McHugh at mcq.mike@gmail.com or phone the Office (01457 871800) for more information or offers of help. Thank you. Places are limited by the capacity of Standedge Tunnel and by early May confirmed bookings had already been received from the maximum of 12 boats agreed with CRT. Offers of help with lock wheeling have been received. These will soon be verified to see whether sufficient help is available. 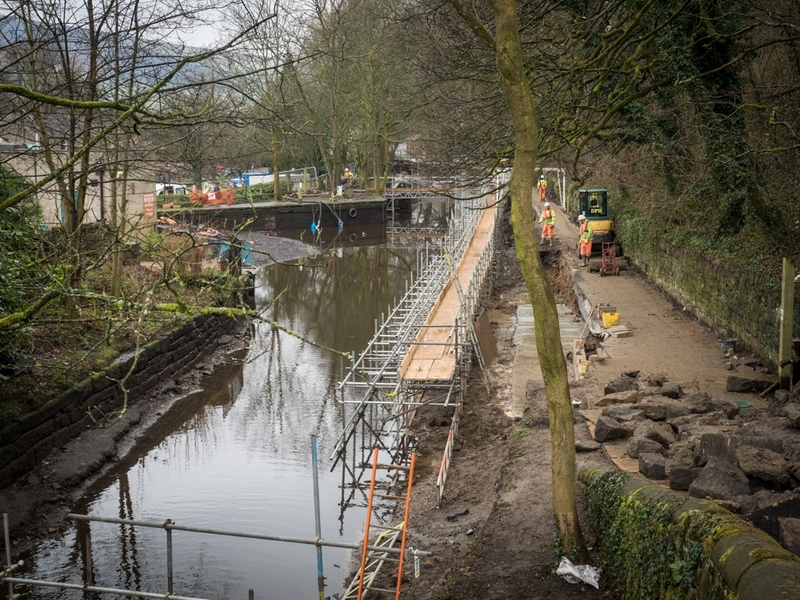 This picture, taken in March by Alan Stopher, illustrates the scale of the work recently completed by Canal and River Trust in Uppermill. It was necessary because of the collapsed state of sections of wall after the November 2016 deluge. 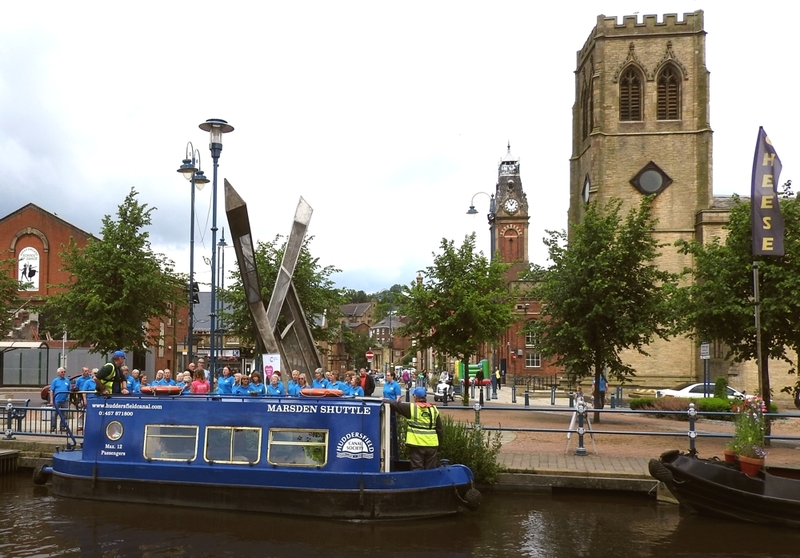 Starting at Portland Basin, Ashton-under-Lyne the cruise will visit Stalybridge, Mossley, Diggle, Marsden, Slaithwaite, Milnsbridge and Huddersfield before finishing at Mirfield. This “Roving Rally” will allow boat crews from elsewhere on the canal network to enjoy the magnificent scenery of our rugged Pennine canal with help from volunteer lock-winders. A programme of evening events will add to the fun. 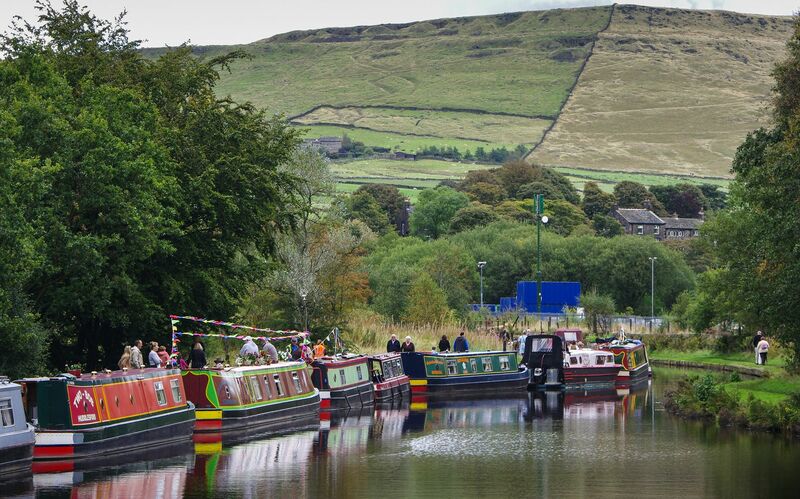 Alan Stopher, Chair of the Huddersfield Canal Society, says “Sixteen years on from its reopening the Huddersfield Narrow Canal has already provided a memorable cruise for many. We also know it has a place on many boaters’ cruising wish lists. To encourage use by those who have yet to visit this waterway gem we’re teaming up with the Canal & River Trust and the Calder Navigation Society to welcome boaters from afar to sample these Pennine waterways for themselves”. Waterway Manager David Baldacchino says “We think the cruise is a great idea. So many people have worked so hard to return this stretch back to navigation and we want as many people as possible to come and enjoy the fantastic beauty that this great trans-pennine link has to offer. The canal offers some of the best sights and scenes and who wouldn’t want to go through the highest, longest and deepest canal? It is hoped that we can recreate a similar scene to the one shown on this photograph taken by Ian Bradbury at the Bi-Centenary event at Diggle Summit in 2011. Places are limited by the capacity of Standedge Tunnel and by early May confirmed bookings had already been received from the maximum of 12 boats agreed with CRT. A charge of £25 will be made to include Society membership for a year, a cast plaque and a copy of the detailed Towpath Guide. Boaters can email Huddersfield Canal Society at hcs@huddersfieldcanal.com to express interest and be put on a wait list should any cancellations be received (2 boats are already on that list.). We’re looking for more volunteers to help with the locks so if you fancy wielding a windlass and taking in the June air please contact the Society via this website.